Although mainly aimed at the pre-adolescent female market, the Hello Kitty product range goes all the way from purses, stickers and pen sets to toasters, televisions, clothing, massagers, and computer equipment. It has a cult-like following among adults as well, especially in Asia, where Hello Kitty adorns cars, purses, jewellery and many other high-end consumer products. 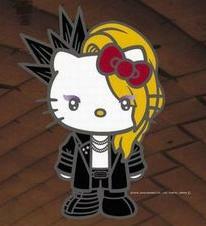 This entry was posted in Hello Kitty, In the News, Uncategorized. Bookmark the permalink.